A worthy cause like none other! I couldn’t resist linking to this blog entry from our good friend Megan Fitzpatrick! 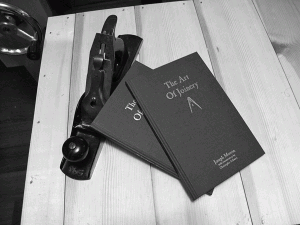 “…on eBay, I’ve up for auction two of the three copies of the long-sold-out 2008 hardcover ‘The Art of Joinery’ I have in my woodworking library. (I’m hanging on to the last one … until I need money for a kidney transplant.) There is no reserve, and the starting bid on each is 99 cents. I don’t know which part of this post I appreciate more? B. Megan’s all out honest in regards to the fact that the money will be used strictly for libations at the upcoming Woodworking in America Conference in Cincinnati November 2-4, 2012. C. Megan’s liver and kidneys lasting this long, given the way I’ve seen the staff of the magazine enter a bar as if they were Chuck Norris and the Delta Force arriving on the scene to end a hostage situation. Please help a sister woodworker out! She’s contributed so much to our woodworking experiences that it only seems right to give back a little. Not to mention you have an opportunity to get a book that you know will ALSO contribute to your woodworking experience. For more information on Megan’s eBay auction visit her post “‘The Art of Joinery’ & Beer. And Bourbon”. My Evil Plot Has Been Discovered! !